All Steinway School! We look forward to celebrating this remarkable milestone with our friends and colleagues at Missouri State University School of Music this evening. 7:30PM Ellis Hall. Hope to see you there! 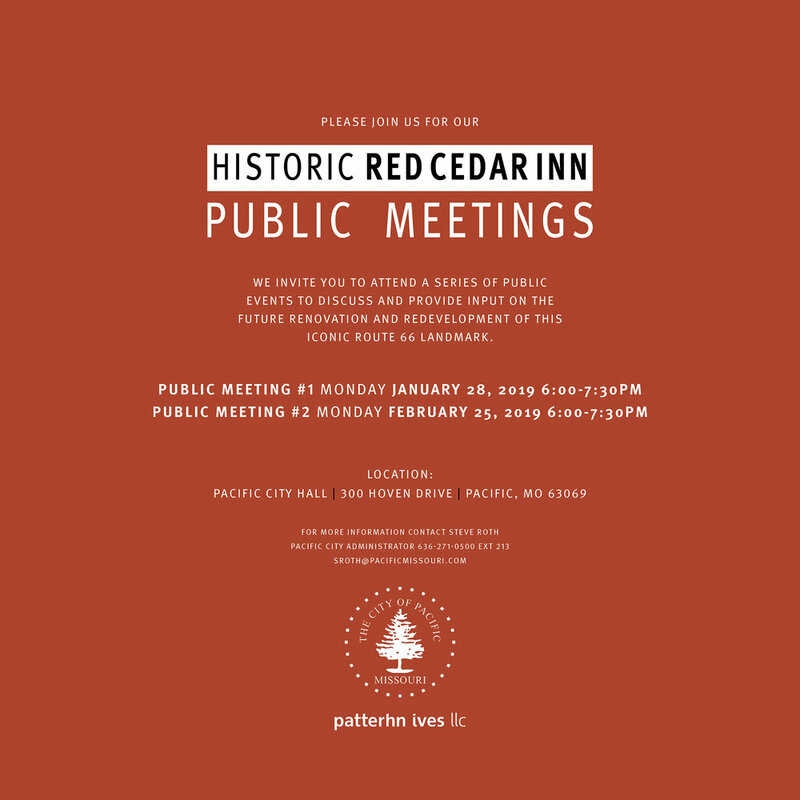 Please join us on January 28 and February 25 for a series of discussions regarding the future of the historic Red Cedar Inn. The intent of the meetings is to solicit public feedback on the City’s plans for the property, which include renovation for welcome center, museum, and potential other uses. The City of Pacific engaged Patterhn Ives in 2018 to perform the ‘Phase One’ planning and programming work. The result of the Phase One study is expected to be presented to the City in spring or summer, 2019. If plans move forward, renovation of the building would likely be underway late 2019. The Red Cedar Inn is listed on the National Register of Historic Places and is an iconic Route 66 landmark. The City welcomes input on the future use of this property. Comments may be made at the public meetings, sent by email to sroth@pacificmissouri.com, or sent by mail to City of Pacific, 300 Hoven Drive, Pacific, Missouri 63069. Thank you to our wonderful clients, creative design teams, and a thoughtful awards jury: Kim Yao, AIA (Architecture Research Office, Principal; Columbia University Graduate School of Architecture, Planning and Preservation, Adjunct Assistant Professor), Andrew Bernheimer, FAIA (Bernheimer Architecture, Principal; Parsons School of Design, Assistant Professor), and Annabelle Selldorf, FAIA (Selldorf Architects, Principal). The 2018 James Harrison Steedman Fellowship in Architecture asks how infrastructure shapes our individual and collective environments. The biennial research competition for early-career architects is organized by the Sam Fox School in concert with AIA St. Louis. Registration and the submission portal open August 15; proposals are due November 1. The competition jury is chaired by Andrea P. Leers, principal and co-founder of Leers Weinzapfel Associates in Boston, who developed this year’s theme. Other jurors include Marion Weiss, co-founder of WEISS/MANFREDI Architecture/Landscape/Urbanism; Lisa Iwamoto, a founding partner of IwamotoScott Architecture; Linda C. Samuels, associate professor of urban design in the Sam Fox School; and Anna B. F. Ives, managing partner of patterhn ives and lecturer in the Sam Fox School. The new sanctuary addition to a renovated 1950’s church fosters a dynamic and welcoming environment for a diverse Jewish faith community. Kol Rinah is the St. Louis area’s newest congregation, yet one with deep roots and a rich history. Seeking a new worship space in Clayton, Kol Rinah partnered with Patterhn Ives to create a synagogue where all generations could come together to experience Judaism in innovative ways. A groundbreaking ceremony was held on Sunday, August 19 to celebrate the sanctuary addition with the community. Kol Rinah was formed in 2013 when congregations Brith Sholom Kneseth Israel and Shaare Zedek merged. The Kol Rinah board approved plans for the sanctuary addition in March 2017, and construction is now underway on the congregation’s Maryland Avenue project. Lay leaders and clergy joined Clayton Mayor Harold Sanger and Andrew Rehfeld, president and CEO of Jewish Federation of St. Louis, at the groundbreaking to celebrate the new addition. Eric was honored to serve on the 2017 AIA Montana Excellence in Design Awards Jury with colleagues, Jonathan Boelkins and John Dwyer. Congratulations to all of the award recipients. 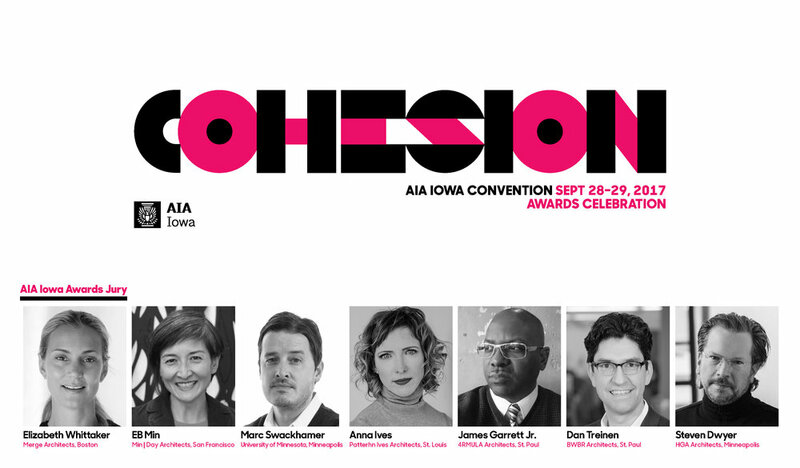 Anna was honored to serve as a juror for the 2017 AIA Iowa Design Awards this September. Thank you to jury chair, Steven Dwyer, for leading the design discussions focused on a remarkable group of projects. Congratulations to all of the award recipients. 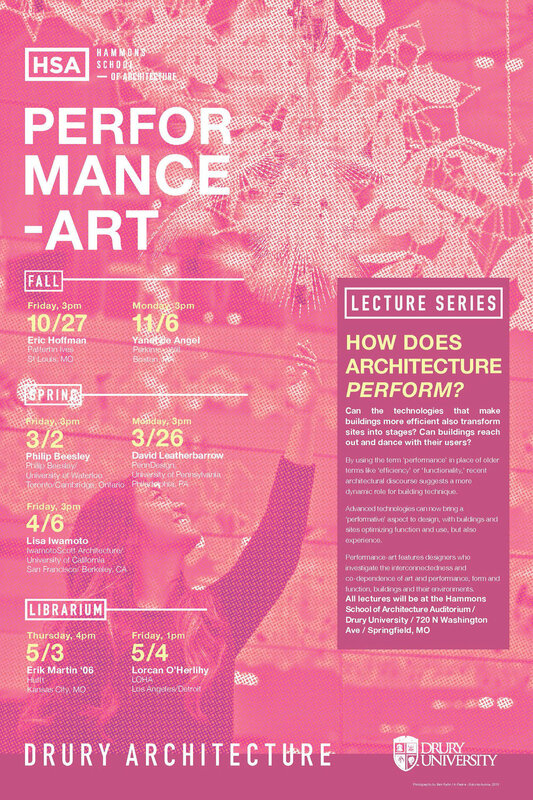 Eric will be kicking-off the Hammons School of Architecture 2017-2018 lecture series 'PERFORMANCE-ART'. Honored to share the work of patterhn ives with the Drury University community. The College of Architecture at the University of Nebraska-Lincoln, in partnership with SGH Inc. and Dri-Design, has established a student scholarship competition recognizing comprehensive design work that exemplifies professional dedication, rigor, open-mindedness, and resourcefulness. This opportunity brings together aspiring architects and leaders in the profession to advance disciplinary knowledge of design and material innovation. Congratualations to the 2017 winners, Mallory Lane and Benjamin Kunz. Tony was honored to be a part of this year's AIA Memphis Design Award Jury with a great group of St. Louis Architects: Jury Chair, Jeff Ryan (Christner), Brent Crittenden (UIC), Valerie Greer, and Gwynn Zivic (Mackey Mitchell). Congratulations to all of the well-deserved honorees. In October, Tony participated in the 2016 AIA East Tennessee Design Awards Jury. The jurors were impressed with the overall quality of the work, and five projects were recognized at the 2016 AIA East Tennessee Design Awards Gala. Thank you to Jury Chair, Matt Griffith of in situ studio in Raleigh, North Carolina for the invitation and for leading the thoughtful design reviews. Patterhn Ives is honored to receive a 2016 AIA Central States Region Design Award for the Newtown Historic Association Archive. We are pleased to announce 2016 AIA STL Merit Awards for Newtown Archive + Meeting Hall and Ellis Hall Renovation at Missouri State University. Thank you AIA St. Louis Chapter, our incredible design teams on both projects, and Jury Chair, Frank Harmon! patterhn ives is pleased to announce that we have been recognized with a 2015 AIA Unbuilt Honor Award for Portal House. Congratulations to our entire design team and to all award recipients from the St. Louis Chapter. American Card Services project receives 2015 St. Louis Magazine Design Award! Happy to announce American Card Services has been named a 2015 St. Louis At Home Architect & Designer Awards finalist in the Architecture and Design category for Commercial Space (General). Great write-up on a new clinic going in at Jennings High School to which patterhn ives had the pleasure of offering pro-bono services for space planning and programming. Very rewarding day with Sam Fentress photographing the recently completed Women's Building Garden Level Renovation. Look forward to seeing the final images: what we saw looked amazing. Thanks to everyone at WUSTL First Year Center, Campus Card Services, Registrar, Social Programming Board, Vice Chancellor for Students, and Trivers Associates.